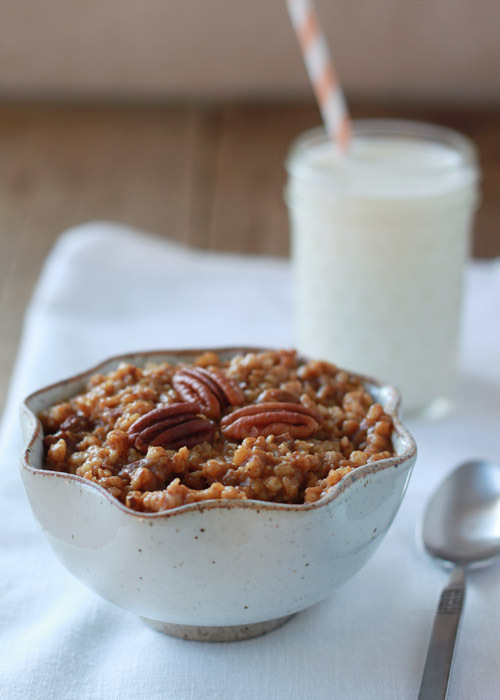 Perfect for fall, this creamy spiced pumpkin and pecan oatmeal makes for an easy, hearty, and no-mess breakfast. Yawwwwnnnn. It’s Monday morning and we are a sleepy little bunch this morning. Our toddler, or Miss Thing as I often call her, decided sleep was optional last night, so after several hours of singing and rocking and looking at stars, we all ended up in bed watching Finding Nemo for the 27th time after which we finally got a little bit of shut eye. 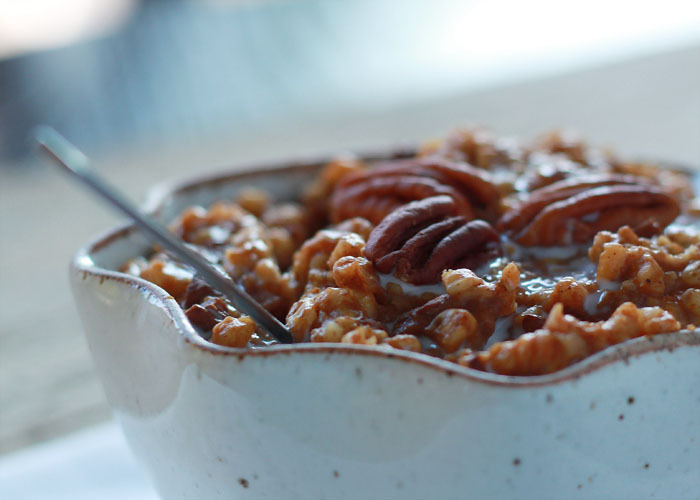 Thank goodness we had this Overnight Pumpkin Pecan Steel Cut Oatmeal waiting for us this morning. It’s the little things that make life a little easier … and not having to worry about thinking up and turning out a breakfast made me happy indeed. I am rubbing my eyes, downing the coffee, and shoveling this yummy stuff in while trying to hammer out this blog post. My daughter is spooning every other bite into the water she just poured all over her highchair tray. The first time we tried this oatmeal was last week, um, for dinner. I was testing the recipe and Miss Thing started exclaiming, “Oatmeal! Oatmeal!” She ate a ton, which is always a victory around here. We love it, too. Even though there’s no milk or cream in this oatmeal, the overnight Crock Pot preparation and the pumpkin make it wonderfully creamy, tender, and even a little decadent. So yeah … oatmeal this way is pretty much the best thing ever. Oh, and another benefit to cooking steel-cut oats in the Crock Pot is that I’ve found that only need about half the oats that you do for more traditional preparations. I think the long soaking time makes the oats swell a bit more. So it totally saves you money – and I would guess ultimately calories, too. Anyway. 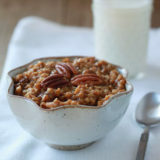 This particular Crock Pot oatmeal recipe is my most recent obsession. It uses a good amount of pumpkin, pumpkin pie spices, and pecans for a creamy pumpkin-pie-esque delicious overnight easy-clean just dang awesome breakfast. In a medium bowl mix 1 1/2 cups water, pumpkin puree, brown sugar, and pumpkin pie spice. Add the oats to a 23-ounce or larger oven-safe bowl (I use Fiestaware or Pyrex are good choices). Pour the pumpkin mixture over the top. Stir. Carefully place bowl in the middle of the Crock Pot and carefully fill Crock Pot with water, to about 1 inch below the rim of the bowl. Sprinkle with pecans. Turn off Crock Pot and remove lid, allowing the bowl to cool enough to lift out of the Crock Pot. Remove bowl and stir well. Sprinkle pecans and additional brown sugar on individual servings, if desired. I’ve joined a few of my fellow Crock Pot loving bloggers to bring you a great bunch of Crock Pot breakfast recipes today. Follow the hashtag #crocktoberfest2013 on facebook, twitter, and instagram to see all of the fabulous slow cooker recipes being shared this week. Ooh, boy! Now this is the way to eat oatmeal…YUM! I can’t think of a more perfect fall breakfast! Great minds think alike, but I’m loving your version! I can’t wait to give it a try. Thanks for joining #Crocktoberfest2013! I love steel cut oatmeal in the crockpot, but I usually make it plain and mix stuff in later. And I don’t usually put water in the pot like that. GENIUS! Cleaning that baked on oatmeal out of the crockpot is never fun. As much as I swoon over my Crock Pot, I HATE scrubbing the sucker! I’m grateful that my guy usually takes on the task. Though usually I think it’s because he’s sick of seeing it soaking in the sink. I make steel cut oats for breakfast frequently during the colder months, but this was my first foray into using a crock pot. I didn’t feel like searching for a bowl as an insert so I will get to soak and scrub, but I’ve got to say it will be worth it. I’m sampling a bowl now as I wait for my wife and daughter to stumble downstairs. Tastes so good I pulled your recipe up again so I could share with friends this morning!! Very disappointing. Bland and gooey. I’ll not be making this again. Zero stars. I’m sad to hear you didn’t like it! It’s been a favorite breakfast of ours this season. My initial reaction the first time I made this was a little “Meh”, too, but I did two things differently the second time around. I added a couple of pinches of salt and another tablespoon of brown sugar. Awesome. Looks delicious! 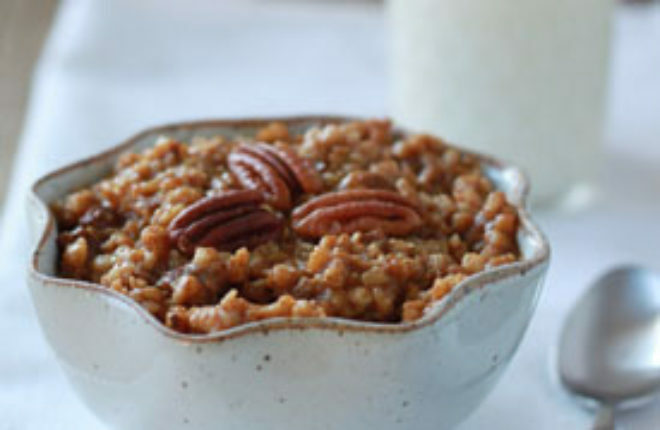 Love the idea of steel cut oats in the crockpot. Yum! I love this! I’ve made it 3 times over the past couple of weeks. It is awesome and perfection each time!!! This recipe is a keeper. Thank you. I was searching for an easy way to have breakfast ready for my 9 month old twins so I tried this out. It tasted great – but I had to add in coconut milk to thin it out because it was super thick and sticky when I woke up this morning. Next time I am going to try my crock pot on the warm setting. 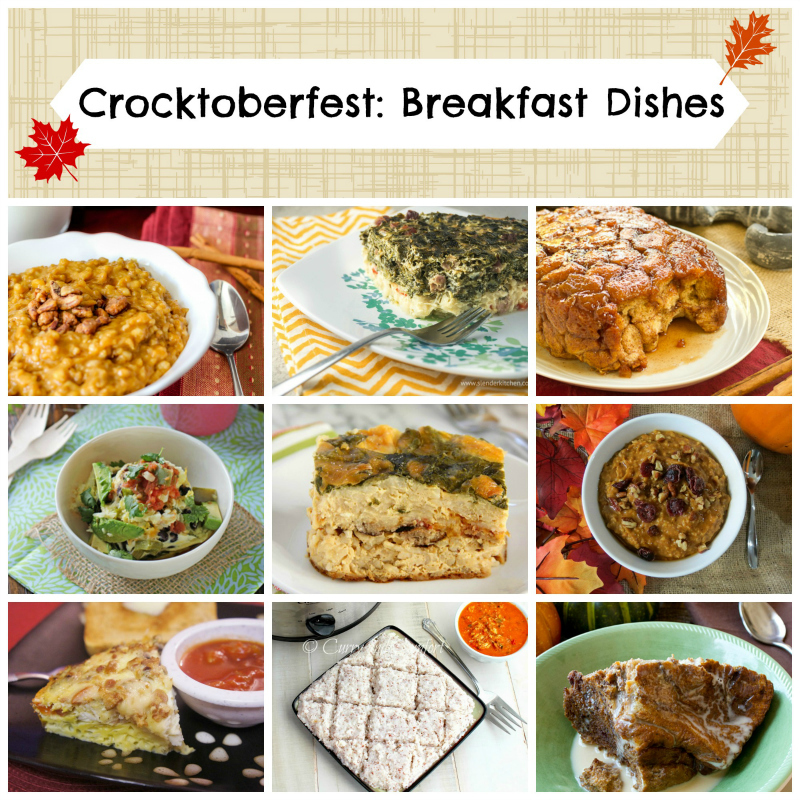 Pingback: Crocktoberfest: Crockpot Breakfast Casserole » Eat. Drink. Love. Pingback: Easy Crock Pot Breakfast Recipes - Wake Up to A Delicious Meal! Wanted to double this for company, but I can only fit 2 20-oz giant ramekin type things in my slow cooker. It would overflow eh? To make it as written, I can just fit one of the same ramekins in there. Thinking I’ll just not put the whole mixture in there, just wondered how disastrous it would be. This looks yummy and I’m not even a big fan of oatmeal. Yum!! This was a really easy way to make overnight oatmeal, and it turned out perfectly! I love steel cut oats but hate the 20-30 minutes it takes to make them in the morning. This recipe changes all of that! This was really good and the oatmeal came out to a great consistency. Even my normally oatmeal-hating husband liked this recipe. 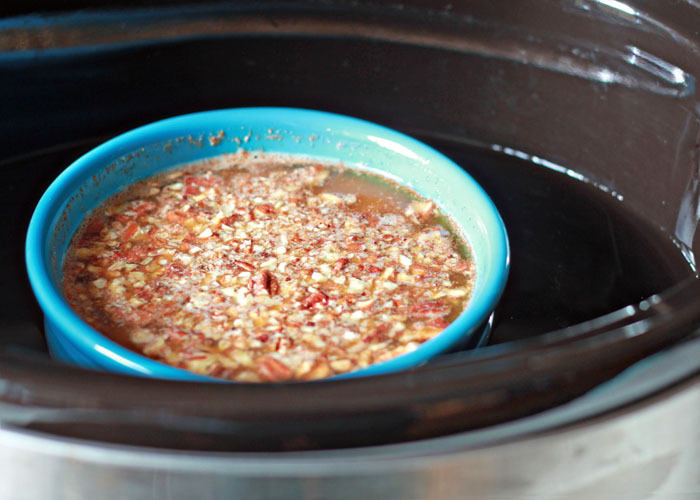 Not having to soak and scrub the Crockpot is definitely an added bonus! Wow is this scrumptious! I’m on my second bowl of stick to your ribs goodness! Before serving, I poured 1 tbl heavy cream over each serving (naughty I know! ), and yum! After being stuck inside due to sub zero temps, this is a real treat. Will definitely make again, especially since now I have almost nothing to clean up! Whoa!!! I finally found a recipe/method that both my hubby and I love!!! Question. I don’t have a ceramic/glass bowl that will fit (I had to use the insert from a smaller crockpot this test), but I have found a metal bowl that will fit…will that work? when I made this recipe, the pumpkin separated from the oatmeal and I felt that the flavor was very lacking from the oatmeal. Any tips to prevent this from happening I think I followed the recipe exactly as you stated. Hi Derek, yes, there does tend to be some separation which is why it should be stirred after cooking. As far as the flavor goes, that might just be a personal preference thing. You could try doubling the pumpkin pie spice, or if you prefer a sweeter oatmeal, perhaps add more brown sugar or a drizzle of pure maple syrup?